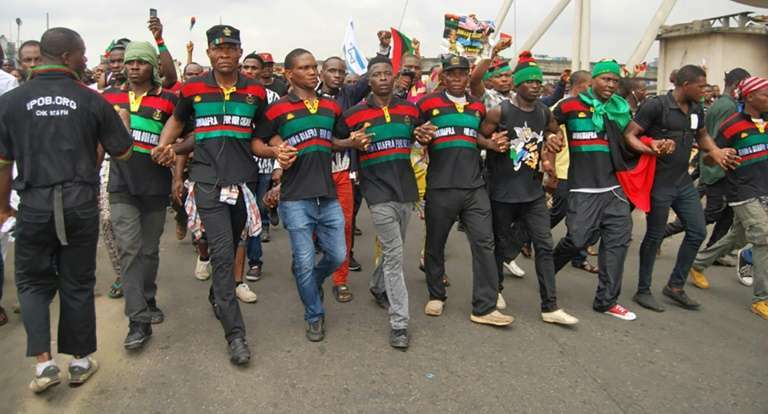 Abakaliki – The leadership of the Indigenous People of Biafra (IPOB) has directed its members particularly those living in Anambra State and its environs not to go out between 6pm November 17 to 6pm November 18, but to sit at home during the poll, alleging that the Federal Government of Nigeria in cahoots with some governors of APC and some other leaders from the zone have plotted to unleash more killings on them during the Anambra 18th Governorship Election. Emma Powerful, Spokesman of the pro-Biafra group in a statement on Thursday made available to INDEPENDENT in Abakaliki, disclosed that the intelligence unit of the separatist group had infiltrated a meeting where the plot to create a scenario of crisis and violence during the election in the name and guise of IPOB was hatched. 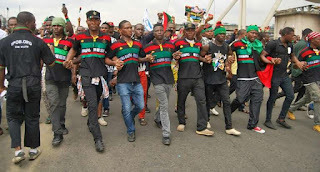 Comrade Powerful said that the intelligence before them hinted that thousands of miscreants have been booked to storm Anambra State on 17th of November with Biafra flags, emblems and other Biafra identifications to cause confusion and pandemonium so as to get the opportunity to substantiate their claims that IPOB is a violent terrorist organization. He alleged in the statement that the hired miscreants have been promised a hefty sum of money each and that all the logistics had been put in place to enable them storm Anambra state during the forthcoming election, during which they would engage security personnel and innocent civilians in a violent confrontation. Powerful noted that the sole purpose of the evil plot was for the Federal Government to prove to the world that they had good reasons for proscribing and declaring IPOB a terrorist organization and for the US and other world powers to also declare IPOB a terrorist organization. He therefore urged their members in Anambra State to stay at home and boycott the election governorship poll. The statement reads in part: “Biafrans must be at alert because corrupt politicians in the South-East working in tandem with the civilian killing Nigerian military will stop at nothing until they carry out of their devilish plans to implicate IPOB. “They have mobilised vehicles, printed fake Biafra flags and IPOB uniforms; they have acquired automatic rifles and guns for this dangerous crime against our people during the election period. Biafrans are therefore required to observe a curfew from 5pm 17 November to 5pm November 18, 2017. “Anybody found outside within this period will be killed by these thugs and men of the Nigerian Army. Every Biafran, especially those in Anambra and neighbouring states must not venture into Anambra State either on foot or aboard any vehicle. “The evil plotters promised to give out the sum of N20,000 each to those who volunteer to kill their fellow humans in Biafraland particularly those who would be travelling to or coming out of Anambra State during the election period between 17th and 18th November. As a responsible people oriented mass movement, we are worried about this cruel plan to massacre innocent people once again in Biafraland. “We are advising every Biafran to stay in their homes and not venture outside from sunset on the 17 of November to sunset on the 18th. The Nigerian Army, Police, Navy and Civil Defence Corps are coming to Anambra State to kill as they did in Abia and Rivers during their illegal and murderous Operation Python Dance II. If you don’t come out, they will not kill you. Stay safe, stay indoors,” Comrade Powerful explained.